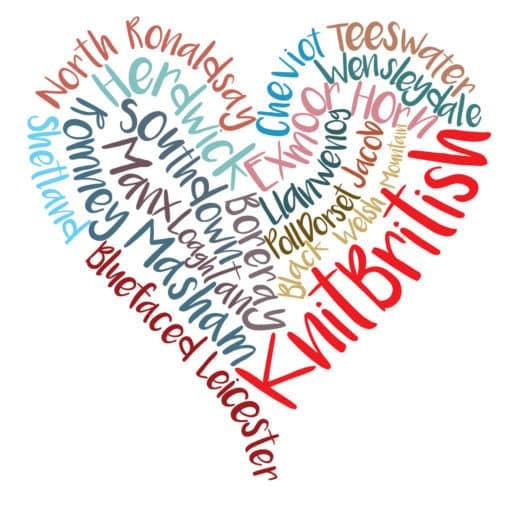 Thank you for your feedback on the last two special episodes – my report from the North Atlantic Native Sheep and Wool Conference and also my episode with Mica Koehlmos on Machine Knitting – I am so glad you enjoyed these and it was lovely to hear from those who have been beguiled by domestic knitting machines too! After threatening…ahem, I mean expressing interest… to interview Pip, (aka Ramsay Baggins and one half of the Tipsy Knits podcast) I finally got down to chatting with her at FerretFest. What did we chat about? SWATCHES! Pip and I have a mutual love of a swatch and the power and information it can hold! Regardless of what I say in the episode, there IS still time to take part in the Shetland Exploration. Raid that stash, I know you have some! Let’s look at an old favourite together, in a new light! We are looking at 5 more breeds in 2018 (8 breeds and a whole breed group was a lot this year!) Deadlines will be out in due course and I will open up most of these groups straight away so that you can get started! No excuses not to do two (or more!) wash, blocks and wears in 2019! New to Wool Exploration? Read this. We will follow the same process as before. So if if you want to join in, start your sourcing/shopping now. This section should be renamed – Let’s listen to Louise mis-pronounce the yarn name all the way through! With apologies to Ballacosnahan Yarn – I tried, but I mostly failed. IF ONLY I had looked at their Etsy shop first, I would have seen that the yarn actually bears the label “Manx Loaghtan Produce” *face palm emoji* – that would have been FAR easier to say. Manx Wool Exploration chat thread is here. 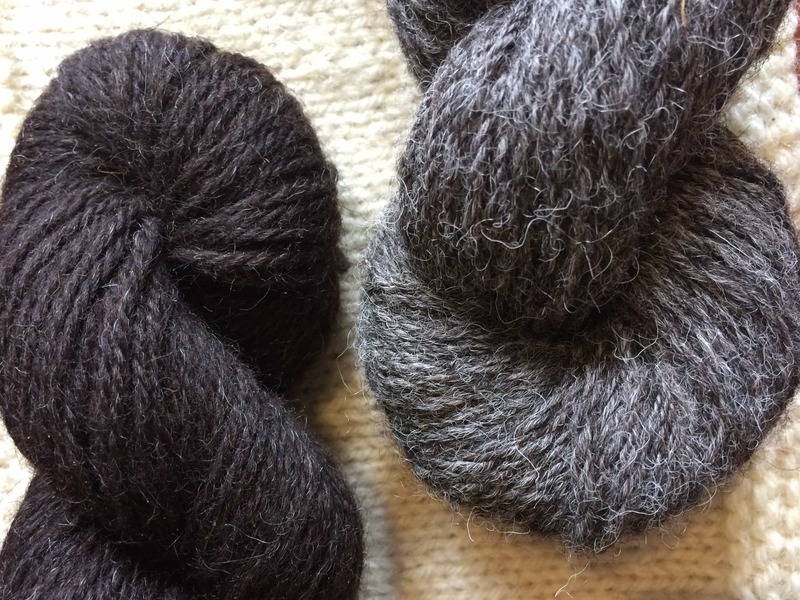 Yarn: Ballacosnahan / Manx Loaghtan Produce Aran, DK, 4ply and lace ; Black Bat Rare Breeds; Crafternoon Treats; Garthenor and Blacker. Wool Explorers: KateBread; KnittingJinny; SilverSpringKnit; DryGardening; Bellarah19; Dreynold; Cynspins; SmallBirdWorkshop; RamsayBaggins; BeckiP; Rebecca72Jones; PracticalCat and GinervaMakes. Hover over each image for the credit. 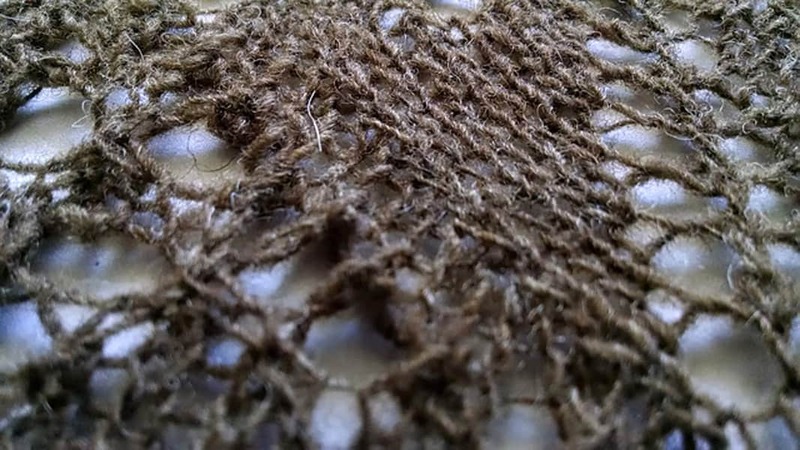 I’m sure you have heard about Anna’s technique, this is an incredible direction for knitting, particularly if you’ve ever thought you’ve seen it all, or if you’ve ever thought traditional stranded knitting isn’t for you. Using a combination of hand-dyed and natural wool yarn, Anna has created 11 pieces, from accessories to garments. It’s a little bit mosaic, a little bit intarsia, a little bit stranded, but it is also 100% unique. I love that she has chosen to pair woolly natural shades with hand-dyed. The book is a fantastic dive into the technique – there are around 40 pages dedicated to this, and also on finishing, on avoiding frustrations, terminology, abbreviations and a fantastic section dedicated to yarny resources. The patterns are well laid out with incredible photography and beautifully styled. I also love that the models are all also styled in Marilla Walker designs, which you can find links to the patterns and create yourself. This is just another reason why I love Anna. Her approach is all-encompassing, supporting other makers and indie businesses wherever she possibly can. Marlisle is a beautiful book and as engaging as the knits will be! I think you can have a lot of fun pairing your stash up for these projects. I have a hozkwoz hat on the pins just now using BFL Masham (I say Dovestone in the recording, but I am wrong!) and Lore DK (which the muckers reviewed recently) and I really love the process of marlisle. Have you tried marlisle yourself? Marlisle costs £21.50 and is available from annamaltz.com and LYS stockists. So many of us in the woolly-knitty world have lots of hats that we wear (I’m not a fan of the term “side hustle”, personally) and sometimes we can wear an astounding amount of hats. I’m very glad of most of the hats I’ve worn in recent years. Most of them have brought be joy, education, friends and a whole lot of wonderful experiences. However sometimes you just know when its the right time to take off a hat or two. This year I’ve hung up my Wovember hat and I know most of of you are aware of this by now. I was honoured to be asked to curate a week of posts a few years ago and that week quickly turned into me becoming part of Team Wovember. However, for reasons Felix and I have already outlined, it became a lot of work. Thankfully, it has been a joy to see you all use hashtag Wovember on social media this year. Wovember continues in other ways and it is up to everyone to carry it forward. I’m also hanging up my Podcast Lounge hat too. I had only 4 episodes under my belt when Jo and Mica asked me if I would host an area at their 2015 festival. Talk about honoured! Back then there were no areas at any yarn festivals that were truly dedicated to socializing throughout the event, never mind podcasts. It was incredible fun to organise, I learned such a lot personally, I made a lot of friends and it provided me and all the other podcasters with the opportunity to meet our audiences. Podcast Lounge opened up my world! Since the first Podcast Lounge in 2015, a lot of other events have taken their lead from Jo and Mica. I’ve been asked to host quite a few podcast areas and I always say that for me, there is only one podcast lounge I will ever host – the original and best – at Edinburgh Yarn Festival! I think EYF is firmly established as a totally sociable event and – unlike the first podcast lounge – there isn’t anyone asking anymore “so what is a podcast, anyway”. I stood back, with tears in my eyes this year, watching people sit in podcast lounge, meeting for the first time and comparing notes on which podcasts they liked and adding new suggestions to their lists. I don’t need to host and organise a space anymore – it was serving its function perfectly. I’ve loved organizing PCL and I’ve loved being the liaison for visiting podcasters and vloggers – but all this takes time too and when you work full time in the non-wool world it becomes a lot of work and time. I will always be grateful to Jo & Mica for that opportunity and all it brought me. It doesn’t mean I will be not attending or involved in EYF2019, but it does mean a bit of an evolution. There will be more on this soon, but I wanted to tell you the news. Again, I can’t express what doing this has meant to me, but the time is right to take a bow. I am sure there will be those of you who will miss the lounge but lets remember that this is *the* most sociable yarn event ever and one of the longest. There will be opportunity to hang out in that marvelous marquee too as well as at the various knit nights and events – so HURRAH for that. 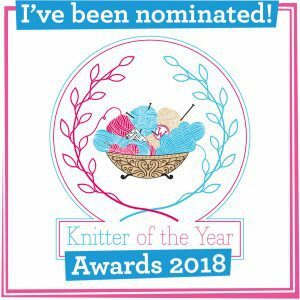 How delighted was I to get an email to say I had been nominated as Online Innovator in their Knitter of the Year Awards 2018? It is very lovely to be recognized by KnitNow. They are so supportive of indie designers and of podcasts, vlogs and blogs. You can vote for me – if you so wish – and a whole load of wonderful people by clicking on the image above, which will take you to the KnitNow website. Voting closes on 31st December. Our annual Christmas pattern swap is happening again in the KnitBritish Ravelry group. This is the fifth year! The time of year where we ensure our pattern wishlists are up to date and then sign up to have a pattern gifted to you. In turn you gift a pattern to another, from their wishlist. Its just a small gesture which ensures we all get something we’d like this festive! There’s not much time to sign up – 19th December and I will pair up people by the 21st. I want to thank you for all of your support in 2018. We celebrated 100 episodes this year! Thank you for everything you do for the podcast – for listening, for following, for reviewing on itunes and your podcatchers – taking the time to rate and recommend is amazing. Thank you for all your correspondence and for knitting jumpers for our 100 episodes. Thank you if you have used ko-fi. 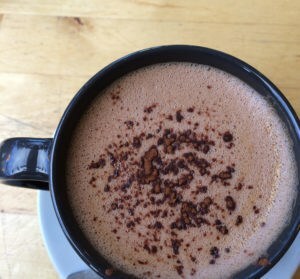 I haven’t mentioned Ko-fi on the podcast since I told you I had opened a donation page, but there is a link on the website. For the price of a cup of coffee you have paid for the hosting of the website this year and kept me in coffees while I work on KB. So thank you so much. I made a consious decision not to sponsor the podcast – one reason is simply because administering to that takes a lot of time when you have a f/t job, but your contributions have meant that costs have been covered! Thank you so much! I know we lost a few listeners along the way this year, who weren’t so onboard for me to talk about things other than knitting, so farewell to them and hello to all of the new listeners. Downloads are way up this year and it is lovely to hear from those of you who joined us this year. Thanks for all of your involvement in the ravelry group, from Remakery, to Good Intentions (returning in February!) to the return of the Natures Shades, to just spending time in there, talking wool and being a supportive community – THANK YOU! There may be a mini-episode about Wool Exploration before the end of the year, but as far as our usual format goes, this is the last full show of the year. Take good care of yourselves this festive season. As you know, I like to hunker down, eat Quality Street, knit and take it easy at Christmas. I’m not much of a fan of the festive and I know there are those of you who struggle at this time of year and I hope you can carve out some peace and be gentle with yourself! We will of course be ending the show with The Dance of the Sugar Plum Rough Fells, for the fourth year in a row. This uses a recording made and kindly donated by my woolly mucker Felix Ford (you can find her recordings here on soundcloud) and then I took it and maaaaa-shed up with The Dance of the Sugar Plum Fairy, played by Kevin MacCloud (available on freemusicarchive). For those of us who don’t mind a bit of Baaaaaa with your festive, here is – for the fourth year – The Dance of the Sugar Plum Rough Fells. This uses a recording made and kindly donated by my woolly mucker Felix Ford (you can find her recordings here on soundcloud) and then I took it and maaaaa-shed up with The Dance of the Sugar Plum Fairy, played by Kevin MacCloud (available on freemusicarchive). It will play out our show. Note there are swears at the very end of the podcast (after the music!) I will mark it as explicit on iTunes, for the swear-police. I was given the Cochno Yarn and Anna Maltz’s Marlisle for free. My reviews of these are honest. No, I am not a shop. Sourcing the yarn or fibre, either locally or elsewhere, is part of your exploration. Once I open the chat threads in Ravelry there will be discussion in there on sources. Next PostWhat is Wool Exploration?